Reproduced from King's Views of New York Stock Exchange (1897). This group of images shows the successive buildings at the addresses from 30 and 40 Wall Street east to William Street: the corner site at 44 Wall was occupied by a series of buildings for the Bank of America. In addition to illustrating the progressive evolution from short to tall, they also capture a seldom-noted phenomenon of growth: adding a few additional stories to the existing structure. 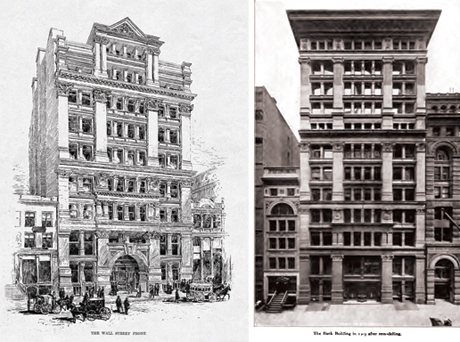 Left: Manhattan Bank and Merchants' Bank Building, rendering by Hughson Hawley, Harper's Weekly, January 31, 1885. 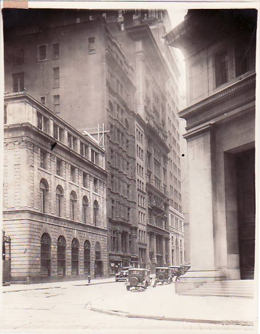 Photograph of the north side of Wall Street from corer of Wall & Broad Streets. Mueser Rutledge Collection. Likewise, the little building to the west (left) grows from four to six stories. In the photograph below it stretches to eight stories, without rebuilding the lower floors. This photo, which takes in the view east from outside "the Corner" headquarters of J.P. Morgan at 23 Wall, makes clear the massiveness of the sheer walled canyon of the block in the 1920s, just before demolition began for the 40 Wall Street skyscraper. The address 40 Wall Street was long associated with the venerable Manhattan Company, established in 1799 to provide pure water (at a profit) to lower Manhattan, and its associated bank, known as the Bank of the Manhattan Company. Similarly, the Merchants' Bank occupied a building at 42 Wall Street since its establishment in 1803. 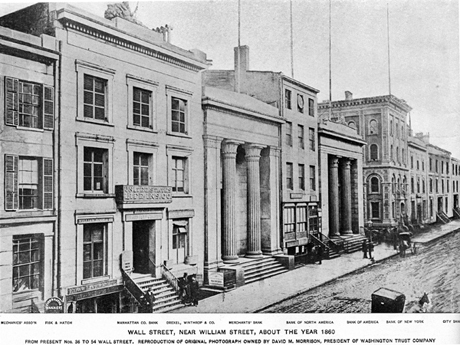 The early photograph reproduced above shows the street in 1860, with the Manhattan and Merchants' banks designed in 1847-48 and 1839 respectively. When first publicized, the 70-story skyscraper at 40 Wall Street was to be named the Bank of Manhattan Company Building. The bank was to be an anchor tenant, not the building's owner, who was a speculative developer, George Ohrstrom, and his investor partners. The elevation drawing at right, from the office of the architect H. Craig Severance, shows an intermediate version of the design, dated July 9, 1929, that envisioned a taller and more solid base structure and assumed that the 30 Wall Street site would be included within the development, which ultimately it was not.